Add contemporary style to your look with this stylish two colour signet ring. 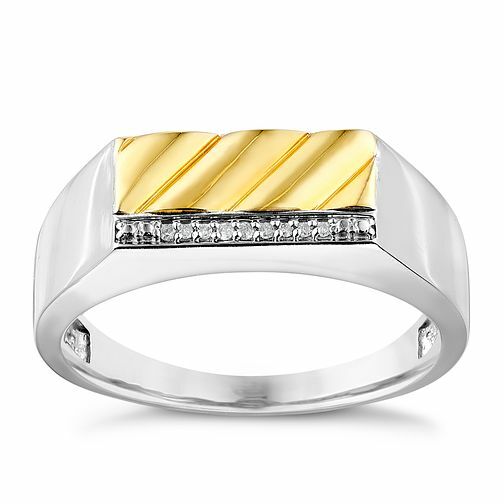 Crafted from sterling silver with 9ct yellow gold detailing at the centre finished with diagonal grooves, this sleek and sophisticated ring is also set with a single row of glittering diamonds for an added touch of luxury and style. Sterling Silver & 9ct Yellow Gold Diamond Set Signet Ring is rated 5.0 out of 5 by 2. Rated 5 out of 5 by Anonymous from Stunning Ring Very impressed with my purchase, very elegant and sophisticated ring. Rated 5 out of 5 by Anonymous from Beautiful ring for a man Beautiful ring, very stylish especially with mix of white and yellow gold. Excellent ordering and delivery service. Thank you.